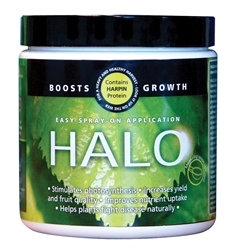 HALO is foliar applied or used as a seed or tuba pre-treatment. Halo’s unique natural protein leads the plant to believe it is under attack, this ‘tricks’ the plant and naturally forces the plant to ‘defend itself’ turning on stress-defence and growth systems and reproducing very rapidly. If a plant ‘believes’ it is under attack, it will grow and reproduce at rapid rates as a means of ensuring it’s survival. This results in a healthier and more productive plant with an increase in crop vigor, stamina, nutrient uptake and reproductive growth (depending on time of application).